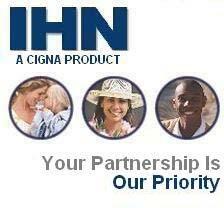 Welcome to IHN's online Provider Directory. You can use this service to locate a participating provider near your home or office, or find a specific provider by last name. IHN, Inc. attempts to keep this directory accurate and up-to-date. However, as with any PPO arrangement, you should verify plan participation with your individual health care provider prior to selecting the network, or receiving health care services. Locate participating provider near your home or office. Look up specific provider by name. Enter the last name of the provider you are trying to locate.